Globe is taking the role of catalyst of innovation in today’s modern world. The telecom company confesses that it is a fan of breakthroughs in terms of technological advance that’s why it keeps on support several pursuits to make the our daily lives even better. 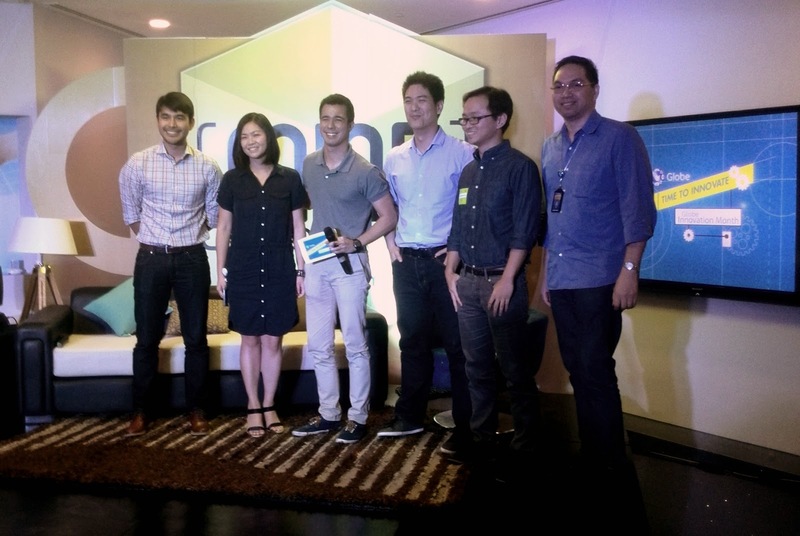 Globe VP for Product Management Pebbles Sy-Manalang (2nd from left) together with some of the Globe Innovation Month speakers, namely (from L-R): ABS-CBN news reporter Atom Araullo; Play FM DJ Justin Quirino, ZAP co-founders Justin Lim and Terence Lok, and Core Platforms Director Francis Pugeda. “At Globe, we believe in innovation. More than that, we believe that we have innovators within our midst. That is why we are gathering employees, vendors and partners to share the newest technological developments through learning sessions and booths for curious minds,” said Pebbles Sy-Manalang, Globe VP for Product Management. Thus, for the month of August, Globe has prepared four major activities that would make employees re-envision their life, namely: Mind Brew Talks, iSpark, Globe City, and Globe Innovation Forum. Through a relaxed, sit-down café forum, Globe employees learn from top innovators at the Mind Brew Talks. Experts of different fields such as performance artist and corporate trainer Gabe Mercado; news reporter Atom Araullo; creative geeks Tonypet Sarmiento and Jason Drilon; startup founders Terence Lok and Justin Lim of ZAP; and Kalibrr co-founder and CEO Paul Rivera were invited to inspire employees to share their thoughts and ideas and make them realize that there is always a more effective and creative way of doing things. Globe developer community Globe Labs is likewise, helping employees unleash innovation and break boundaries through iSpark. Similar to international hackathons which Globe Labs organize, iSpark encourages employees to form groups, prepare their hack concept, make it happen, and pitch their app.To make things more exciting, Globe has created Globe City, a virtual platform where everyone has the opportunity not just to share their ideas but to turn them into reality and earn from it, all in a fun gaming environment. Fifty learning sessions are also lined up for the Globe Innovation Forum on August 26 by vendors and partners such as Nokia, WSA/Telco Systems, Gemalto, SMSGT, DTQ, Stratpoint, Acision, Teradata, Amdocs, SmartQ, Evolving Systems, Huawei, WSA/TeleDNA, Nominum, and SAS.